Why Has INDIA Experienced The World's Biggest Blackout? Was It A Solar Flare? A medium-size solar flare erupted from the sun this weekend, hurling a cloud of plasma and charged particles towards Earth on a cosmic path that was expected to deliver a glancing blow to our planet on July 31st, according to space weather forecasters, the day the massive power outage took place across India and Pakistan. 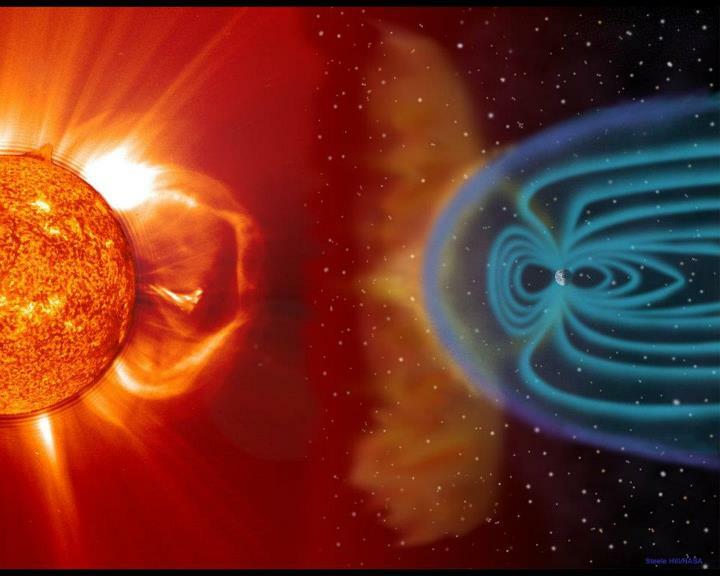 The M6-class solar flare exploded from the sun on Saturday -- July 28th -- unleashing a wave of plasma and charged particles, called a coronal mass ejection (CME), into space. "This is a slow-moving CME," astronomer Tony Phillips wrote on Spaceweather.com, which regularly monitors space weather events. "The cloud's low speed (382 km/s estimated) combined with its glancing trajectory suggests a weak impact is in the offing. Nevertheless, polar geomagnetic storms are possible when the cloud arrives." The colossal power cuts across 2,000 miles -- from the border with Burma in the East to the border with Pakistan in the West -- in such a widespread area of the world's second most populous nation appeared to have been like a disaster movie unfolding in real time with every aspect of modern life grinding to a sudden halt. They hurt India's pride given that the country aspires to become a regional economic superpower. In cases when demand outstrips the power supply, the system of circuit breakers must be activated, often manually, to reduce some of the load in what are known as rolling blackouts. But if workers cannot trip those breakers -- because their immediate masters won't let them -- a set of small failures can cascade into a much larger blackout. Rabindra Nath Nayak -- chairman of the state-run Power Grid of India -- said, "tripping at several interconnectivity points of the [northern] grid could have had a cascading effect." It is difficult to say whether this was a manmade disaster compounded by natural phenomena. The truth is that India has failed to build up enough power capacity to meet soaring demand as its GDP has grown at a break-neck 8 to 9 percent in recent years. As a result, India’s demand for electricity has soared along with its economy, but utilities have been unable to meet the growing needs. India’s "Central Electricity Authority" reported power deficits of between 8% and 10% in recent months, which are dragging on the country's economic growth. This despite the fact that between 25 percent and 40 percent of Indians are not connected to the national grid at all. This power outage, unusual in its reach, raises serious concerns about India’s outdated infrastructure and the government’s inability to meet India's huge appetite for energy although its impact was softened by Indians’ familiarity with frequent blackouts and the widespread use of backup generators for major businesses and essential services. PM Manmohan Singh had vowed to fast-track stalled power and infrastructure projects as well as introduce free market reforms aimed at reviving India's flagging economy. Power Minister Sushilkumar Shinde conveniently blamed the systemic power collapse on some states drawing more than their share of electricity from the over-burdened grid. Uttar Pradesh's top civil servant for energy responded by stating that outdated transmission lines were at fault. 3. Absence of government leadership. Is this going to have a substantial adverse impact on the overall economic activity and output of India? Power failure on such a massive scale for two consecutive days is likely to hit sentiment and output very badly according to distinguished members of the ATCA 5000 based in India.